“Now, why did I promise that?” Have you ever said that to yourself? Ever had one of those moments when you said you would do something? But then, when you realized what it would take to fulfill your commitment… well let’s just say, you had second thoughts! Ask God about the hurts you have endured. To heal them. To teach you. Ask Him where you need to forgive. Ask God to bring to your mind the moments of joy. To hold onto them. To be more grateful to for them. Ask God about His hopes for you in 2018. I am doing the same. I will update you in early 2018 from my time away with Him. And I hope to hear from you, too. When you go away and ask God to speak to you, it is perhaps something private. Should I even tell you I’m going away to pray? Aren’t we supposed to go quietly into our prayer closet? And what if the results were private? Further, it causes me concern. To presume to say that God “spoke” with me? Well, I tend to pause. I have friends who tell me that God has spoken to them. Don’t misunderstand. I know he does speak to us. I just tend to be on the cautious side. However, I committed I would share what is on my heart, and I believe God laid it there. My need to love my wife - value my marriage - more. Before I write more, can I tell you I sat with a close friend and shared these? His comment, especially about the first one (God’s jealousy for me), was that it sounded like the Spirit of God. Proverbs tells us to seek counsel from godly people. (Proverbs 11:14, 12:15, & 19:20-21 to name a few). God’s Jealousy: In the Old Testament, God often cautions his people not to forget him, or his commandments. Many hear those words as threatening, even angry. But I hear that as God’s love. I define worship as “the people and things I give my time, energy, and money to.” I worship those things by showing them I “value” them. God wants more time with me. It makes sense. Prior to coming on board at The League, I served in a Cathedral. Each morning I would sit, most times by myself, in a cavernous Cathedral and pray. Then at Noon, I was back, again at worship. My day was peppered with “timeouts” with – and for – God. In 2018, I need to build new patterns of time with him—and eliminate other things to which I am giving my time, energy, and even money. Leadership’s Weight: Sounds heady. Maybe even arrogant. I like phrases such as “servant leadership” because I have worked for big egos. And I don’t want to be one. Yet there are things I have to do. Things only I can do. It comes with the job. Having the “stomach” to do them, and do them well, will take a great deal of effort. I too often try and perform these in my own strength. I need to take the time to seek more of the Lord. Value My Wife: This is getting personal. Let’s just say in the last three years we have moved twice and changed jobs. That makes for a busy life. It makes for a life where I get focused on “getting things done” and “starting well.” It makes for a life where I can take for granted some of the most important people God has blessed me with. It’s hard to imagine loving, admiring, adoring her more than I do… she’s seriously the greatest. But thinking that and acting on it are different things. Does that make sense? Do you ever struggle with this with the ones you love the most? And so, I’ll just close with two simple requests. Pray for me. And if you haven’t yet, go away and pray. 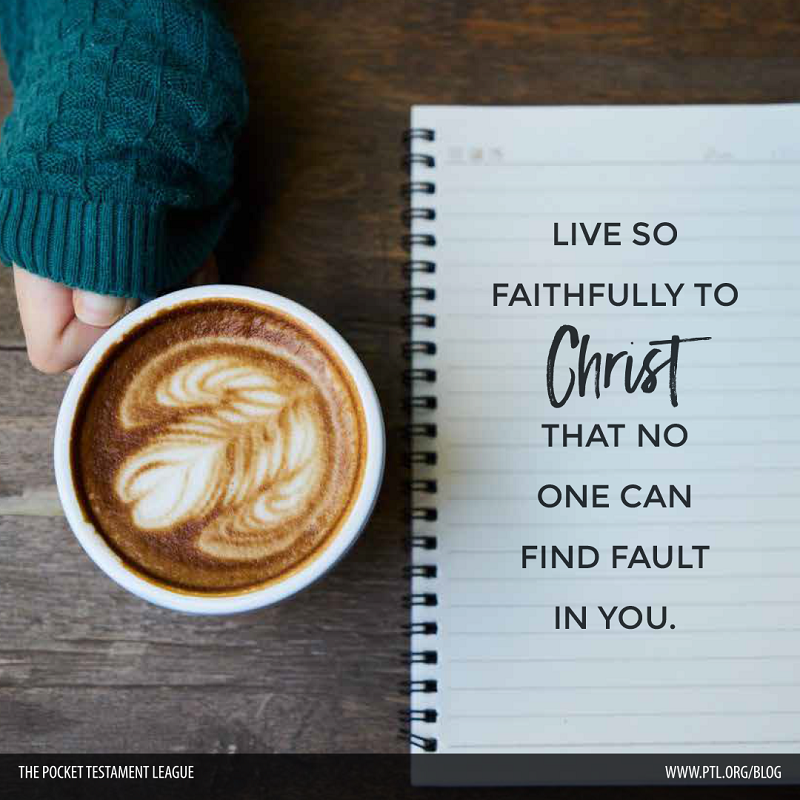 David J. Collum serves as the CEO of The Pocket Testament League, a ministry committed to mobilizing and equipping Christians to Read, Carry and Share God’s Word. David loves Jesus and God’s Word. He is passionate about seeing others meet Jesus, too. For more great content visit his website: www.davidjcollum.com.